The Midland Air Museum as it is today represents many years of dedicated commitment by our volunteers and staff who have helped to establish one of the country's leading self-funded independent aviation museums. We believe it is very important that our museum provides the opportunity for visitors of all ages to experience the world of aviation in a friendly and informal environment. In 2008 we acquired the status of a Nationally Accredited Museum which is a recognition of our achievements over many years. This award is one that we are very proud of and is also a benchmark for our ongoing future development. May I take this opportunity on behalf of the Staff and Volunteers of the Midland Air Museum to welcome you to the Museum and would like to thank you for your support. The Midland Air Museum is a unique aeronautical collection. 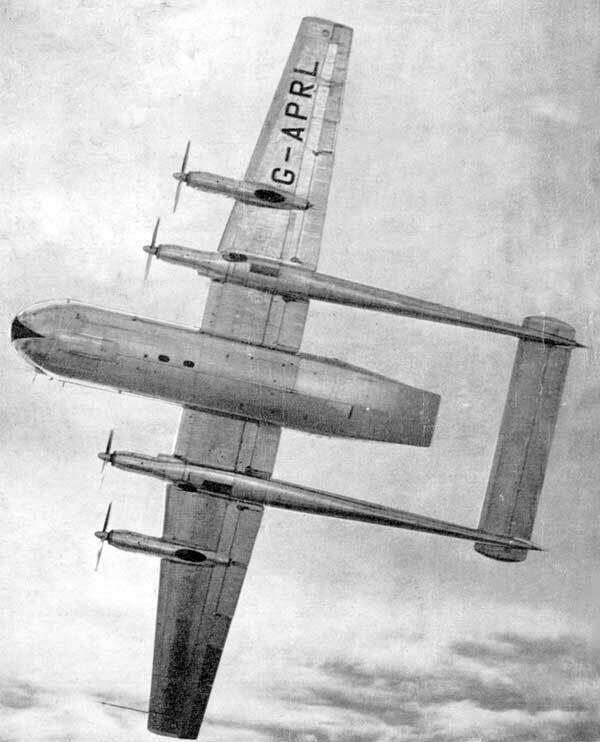 Started in 1967 by a small group of local aircraft enthusiasts as the Midland Aircraft Preservation Society (MAPS), they started to collect books, photographs and aircraft parts. 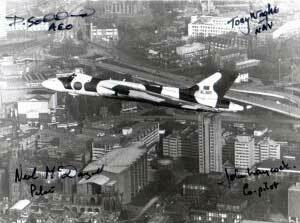 With no permanent home MAPS exhibited at air displays and fetes to raise money for further acquisitions. In 1975 a lease was secured for a small plot of land on the North side of Coventry airport which laid the foundations for a permanent museum. MAPS changed its name in 1977 to Midland Air Museum (MAM) and became a Charitable Trust with Educational Charity status following in 1979. With just five aircraft on display the Midland Air Museum first opened to the public on Sunday 2nd APril 1978 with 67 visitors. Following the arrival of the Vulcan bomber in 1983 and the Argosy freighter in 1987 the museum further developed by moving onto its present site and establishing the Sir Frank Whittle Jet Heritage Centre. MAM became one the first independent aviation museums to achieve the government's Museum and Galleries prestigious registration status in 1990. A World War II Robin Hangar was acquired and erected in 1995 giving the Museum valuable covered space for restoration projects and displays. After a period of consolidation several new exhibits were acquired from the late 1990s onwards including the iconic MiG-21, revolutionary Sea Harrier 'jump jet' and our first all-composite aircraft, the CMC Leopard. MAM has displayed at many outside events including the SBAC Show at Farnborough and has forged many links with the local community and with educational bodies such as Coventry University and industry at local, national and international levels. During 2008 the Museum was awarded National Accreditation status and plans to build on its continued success in the future. The Museum now employs one full time Manager and three other permanent staff members but is lucky to rely upon a large volunteer workforce. An active youth programme is in place to bring new people into the restoration scene and countless hours of unpaid work by juniors as young as 14 up to senior citizens in their 80s have gone into establishing, maintaining and improving this, the Midland Air Museum. The Museum's collecting policy centers on the story of aviation in the Midlands and the Coventry area in particular, but also the story of Sir Frank Whittle and development of the jet engine. 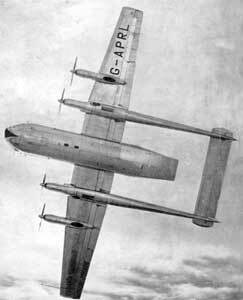 "To advance the education of the public in the preservation of aircraft and aeronautical equipment of historical, technical or other public interest and in aviation generally." 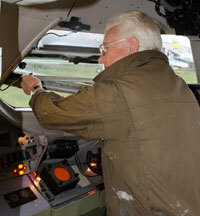 The Midland Air Museum is accredited by the Museums, Libaries and Archives Council (MLA; reg no. 789). The MLA's Accreditation Scheme set nationally agreed standards for UK museums. To meet the requirements of the scheme, museums must demonstrate that they achieve clearly defined standards relating to governance and management, services for users, visitor facilities and collections management. 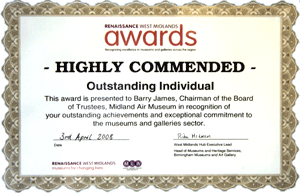 Barry James, Chairman of the Board of Trustees at the Midland Air Museum, was recognised for over 20 years of hard work at the Museum in the Renaissance West Midlands Awards 2008, receiving the Outstanding Individual Highly Commended Award. His work in involving diverse community groups with the museum was particularly recognised together with his close involvement in various national organisations which has established a high reputation for the museum both nationally and locally. 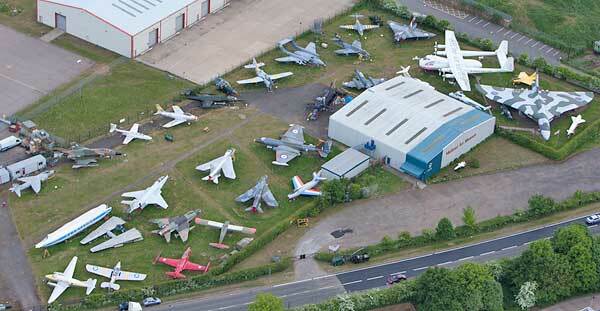 The Midland Air Museum is a member of the Association of Independent Museums. We welcome new volunteers, young and old. Just be aware that it isn't all about working on aeroplanes - the Museum site and buildings also need maintenance! If you are interested in joining the Museum as a volunteer please contact the Museum Manager, Dianne James - see the Contact page for contact details. The Midland Air Museum is a member of the British Aviation Preservation Council.